It continues to amaze me how much the Internet changed the travel industry. I remember what traveling was like as a kid in the 1990s – very analog. If you were going someplace new, you needed a road atlas, a paper map, and all of your flight information if you were going by plane. Today, all you need is a smartphone. With the growth of web-based travel-planning came a slew of businesses looking to cash in. People offering everything from the best travel gear to better travel packages started crawling the web, looking to sell their goods and services to travelers all over the world. By and large, they succeeded, with the travel industry generating over 7 trillion dollars every year. You may already be aware of all this, and wondering how you can get a slice of that pie. You’re an entrepreneur who loves to travel. Why not easily start your own online store and fulfill your business dreams while you travel the world and make money doing it? It sounds great on paper but you need to slow down – there are some things you should know first. Want to know the best thing about doing business online? Everyone in the world is a potential customer. Want to know the worst thing about doing business online? Everyone in the world is a potential customer. It’s a real double-edged sword. When your business focuses on e-commerce, you’re not limited in the same way that traditional stores are. Brick and mortar stores depend on the people who live in the area to make them money. With the internet, you can potentially sell to anyone who has a computer and Internet connectivity. The catch – so can your competitors. And the travel industry is very competitive. There’s an old proverb that says, “When you try to speak to everyone, you speak to no one.” I don’t think there’s a better guiding philosophy for people looking to start their own business. Even though you can speak to the entire world, you definitely shouldn’t. It’s incredibly difficult to convince 1 million people of the same exact thing. It’s much easier to convince 100,000. So, here’s a hard piece of reality that I really wish weren’t true. The Small Business Administration reported in 2018 that half of all new businesses will close before they make it to five years. About 15% won’t even make it to one year. By the time you get to 10 years, just around 30% will still be in operation. Sobering, isn’t it? I will say this though – if you’re serious about launching a successful travel site, you can’t let the data scare you. Business is all about taking chances. You have no choice but to invest your time, your energy, and your money if you want your business to thrive. If you get scared by tough odds, the business world will eat you alive. You definitely have to be a bit of a daredevil to succeed but that doesn’t mean you can’t be smart about it. To start with, you need a solid business plan. More than just to convince lenders or investors to give you startup funds, your business plan needs to be good because it’s what will guide you. Your business plan is what will help you develop your vision, understand your target customer base, manage your operations, outwit your competitors, and set goals for you to pursue. Additionally, you need to prepare yourself mentally and emotionally for the long haul. Some businesses can turn a profit in as little as six months. For others, it can take two to three years. During that time, you’re going to have some failures, you’re going to work long hours, and you’re going to question just why you thought this was a good idea in the first place. That’s every business. Plenty of businesses have closed not because they were failing, but because they thought they were failing. Don’t turn a minor setback into a crushing defeat. If you can do that, you stand a much better chance of being part of that 30% that’s still in business 10 years from now. If you asked most small business owners why they went into business, I guarantee most of them would say, “To be my own boss and do what I love.” That’s the right attitude for a business owner to have but it only tells half the story. You’ll definitely be your own boss but you may not get to do what you love all the time. In fact, you may not be doing it most of the time. Young startups often don’t have the cash to outsource their marketing, sales, HR, accounting, and other business functions. They have to do it all in-house. They’re not necessarily hard, but for you, they may not be enjoyable either. Regardless, if you want to succeed in business, you have to take care of all of them. The point I’m driving at is that you may want to open your business so you can focus on travel but you have to accept the other aspects that come with business as well. 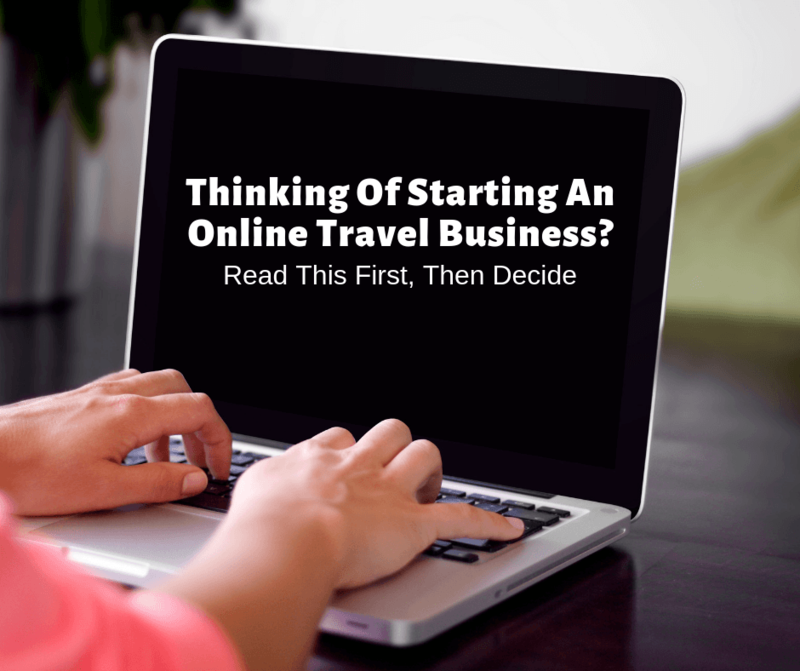 Starting an online travel business, any business, is a lot of hard work. We hope these tips help guide you towards making your dreams a reality. We REALLY want to do what we love because it takes a minute for cash to flow in. Being in love with traveling, blogging AND building a business are musts. I’ve seen friends do this and sometimes, even though they think they’re selling something unique, the fact that the travel industry is very competitive makes it hard for them to reach their targeted sales. However, you’ve stated great things here in your article.